Mother Simorq—equal parts witness, healer, and wise woman—offers a visionary alternative for women who transcend painful histories. 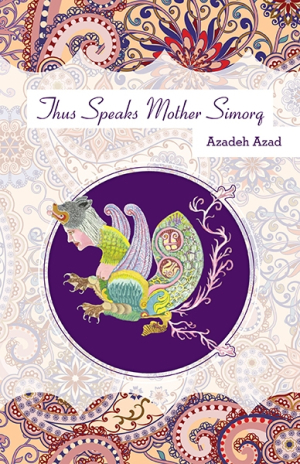 Azadeh Azad’s Thus Speaks Mother Simorq gives voice to a mythological Persian bird woman. In sixteen thematic stories, nightmarish cruelty melds with everyday triumph. Using magical realism, feminist fantasies, reimagined fairy tales, and moral wisdom, the book colorfully portrays women and girls in flux. From the queen of a matriarchal society who loses her power when men conspire to usurp her, to a fairy who is rescued by a prince only to be murdered, to a girl who witnesses her parents arguing while growing resentful of her father, Azad’s characters live with betrayals. Some characters regain their strength. Others remain poised on the threshold of new knowledge. Most rebel against social expectations, leading to tension. In several stories, Mother Simorq offers advice or help, taking on a human form. Whether set in imaginary lands or twentieth-century Tehran and Montreal, these provocative forays explore facets of violence. In “Aqdass at Impasse,” the sexual abuse of her children leads a mother to murder her husband. In “Rudi,” a child similarly confronts her abuser. Both stories refrain from straightforward revenge. The plots are complex because their protagonists face unintended results. Less dramatic scenarios continue threads of misogyny and injustice. These range from short, two-page portraits to the longer “Hymn to the Waters,” which features an unplanned cesarean section in 1976. As a new mother mourns having her choices removed by a male doctor, glimpses of the future offer respite. At times, impassioned sentiments on natural childbirth threaten to supersede the character; the message is written with less subtlety than in other stories. The strongest stories feature girls who are coming of age. In “The Hidden Roots of the Mulberry Tree”—an impressive, unsettling take on domestic abuse—an adolescent girl navigates her family’s secrets while the White Revolution unfolds. The girl’s mother is complicit in her daughter’s abuse, though she regrets the course her life has taken—a fact that adds pathos yet achingly comes to nothing. The narrator discovers that a solitary self-reliance will lead her to a new, more hopeful place. These stories turn wild in their brooding. Shifts in modes and styles make the collection uneven. At times—especially in the final story, a psychological tour of divided loyalties—their traumas seem abrupt. The pace quickens with complicated events, then dissolves into a series of explanatory emails. Still, there’s a singular intensity that paves over the cracks. Behind all of the brutality and potential for bitterness, there’s a surprising belief in the female spirit.